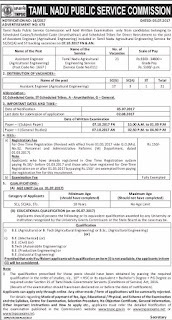 TNPSC (Tamil Nadu Public Service Commission) has recently Declared a Recruitment Positions For 21 Assistant Engineer Posts. If You are Interested In this Recruitment Positions then you can Apply for this Recruitment Online On Or Before 02-08-2017 (2nd August 2017). 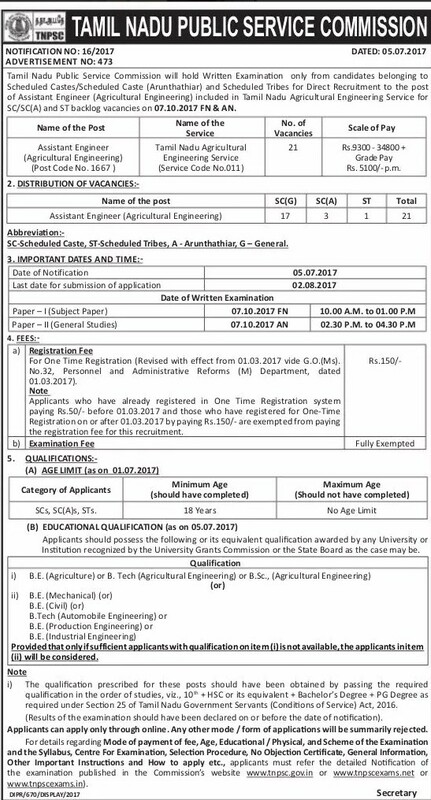 If you want to check the other Informations TNPSC (Tamil Nadu Public Service Commission) Recruitment 2017 – 21 Assistant Engineer for these Posts Like Age limit, Way of Selection, Exam Pattern, its Syllabus, Education Qualification, then please complete Information to the end. Age Limit – Candidates upper age limit should not below than 18 Years As on 01-07-2017. Educational Qualification – All the Candidates Must have done Engineering Degree or similar Education qualification from any University which one approved by the IGNOU.. If You Need More Information Regarding This Recruitment/Vacancy, then please read if Detailed Notification, which is given at the end of the post. Pay Scale – Rs. 9300 – 34,800/- With 5100/- Grade Pay . How To Apply – All Eligible and Interested candidates may fill the online application through official website http://www.tnpsc.gov.in before or on 2nd August 2017. Opening Date of Online Registration of Application Form Is : 05-07-2017. Last Date For Apply Online : 02-08-2017. Written Exam Date : 07-10-2017.